Six-year-old Logan sits quietly in the back seat of his dad’s car, watching his favorite show, Thomas the Tank Engine. Outgoing and polite, Logan makes friends easily, is a hugger, and loves to flash his big, toothy grin. While Logan watches his favorite train characters on his iPad, his dad, Eric, recounts from the front seat the day when Logan’s and his family’s lives changed forever. When Logan was still not feeling well on Monday, his mom, Nancy, brought him in to the doctor. After taking a look, the doctor sent them to the emergency room, where after hours of waiting and multiple tests, Nancy got the news she feared. A tumor was growing in Logan’s body, and it looked cancerous. Once there, Logan was diagnosed with Stage 4 high-risk neuroblastoma and started chemotherapy right away. His first hospital stay was 32 days, and he experienced nearly every negative chemotherapy side effect possible. He lost the ability to walk because his treatments made him so weak. A life-threatening reaction to a stem cell transplant put him in the intensive care unit for five days. Eric says he put over 5,000 miles on his car in one month driving to and from the hospital for Logan’s treatments. 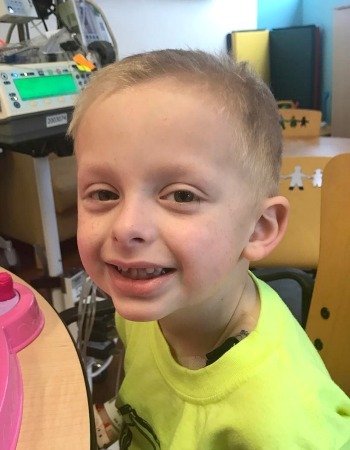 Despite all the tough days, Logan powered through and the chemo did its job – doctors were able to remove 90 percent of the tumor, which the chemo had turned into dead tissue. After recovering from surgery, Logan was able to slowly ease back into being a regular kid – enjoying kindergarten, playing with his older brother and starting lacrosse. He was cancer free for two and a half years, which was a huge victory – a neuroblastoma relapse outside of two years is almost unheard of. But on January 31, 2019, Logan’s routine scans revealed that the horrendous disease had returned. Logan and his family began another grueling treatment path – eight 21-day cycles of chemotherapy. One of the biggest things Logan’s family learned during his fight against cancer was how few treatment options exist for kids. Nancy, an oncology nurse who works with adults with cancer, sees firsthand how necessary second, third and fourth treatment options are for adults – options that don’t yet exist for kids like Logan. Logan’s most recent scans were clear (yay!) but he still has a long road ahead of him. Since Logan’s diagnosis, Eric and Nancy have become advocates for more funding for childhood cancer research. The treatment path Logan is on now didn’t exist when he was first diagnosed, and they are determined to advocate for better, safer treatments that give kids the chance they deserve to beat cancer. Eric has even traveled to Washington, D.C. to help advocate for more federal funding for childhood cancer research. Logan and his family try to live day by day and appreciate the happy moments, especially when the future is so uncertain. More than anything, they appreciate the friends, family and strangers who have stepped up to help out along the way – whether its mowing their lawn, taking in their older son while they are in the hospital with Logan, or starting fundraisers in their honor.